The horrible white and black buttons are back. I still have my two as well. Might pre-order this for my PC. The Duke is one of my all-time favorite controllers. I like but not worth using with that awful d-pad. Time to start lifting. I'm not sure I still have the biceps to support it. This is a joke correct. I used to love the Duke for shooters. Unfortunately there's too many commands in today's shooters and you need those black and white buttons to be easier to access on the fly. Elite controller killed my desire to touch any other controller. Last gen this would've been a day 1 purchase. It's funny because the Duke was ridiculed at release; now MS designs some of the most critically acclaimed controllers around. I love the Duke! It was the best controller for man hands imo. The dual shock always sits a little bit funny, and the Xbox one, my fingers are always overlapping on the back. Was never really a fan of the Duke but i'd like to try it again for nostalgia's sake. Kinda cool. I LOVED the 'OL Duke, but Controllers have progressed since then. That, and I have an Elite. No way I'm playing without it if I don't have to. I prefer to see it as your overjoyed reaction because you love the Duke. I never understood the fascination for the controller. I didn't mind it and it got the job done, but it wasn't as good as the revised S model that came out later. True. But you could kill an intruder with the Duke if you had to. Wasn't the S just the controller that launched with the Japanese Xbox? The Duke was made for big hands. Not with mine, the cable is frayed badly and held together only by the small inner wiring. My launch unit had the Duke, but I bought another system as they were being discontinued and it had the newer and smaller controller. They changed the location of the black & white buttons and other stuff. I have big hands, but still didn't like it very much. Exactly. Throw it and it comes back to you as well. Honestly if the Elite never came out, I would've purchased this. The black and white buttons had horrible placement however if you were playing a game and didn't need quick access to those, I preferred Duke over S, Xbox 360 controller and OG Xbox One default controller. The spacing of the sticks and triggers felt great in shooters. Until the Elite came out, my shooter accuracy was best using Duke. This is purely for nostalgia. 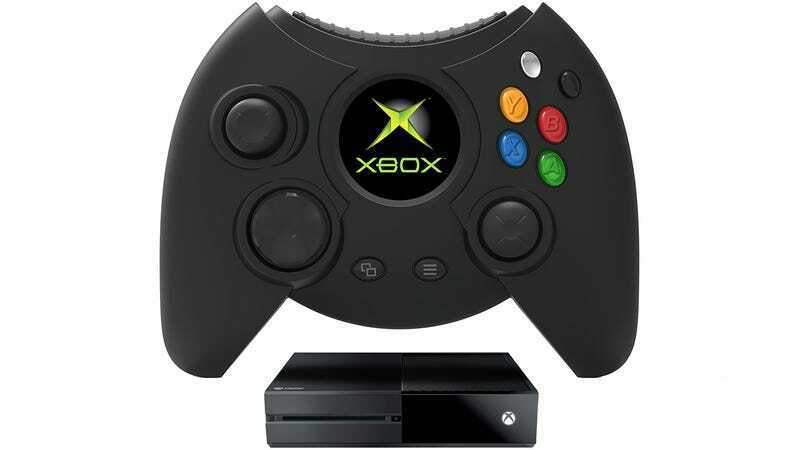 If they didn't do such a great job with the new Xbox One controller, I could definitely have seen something like this as being my main again, but yeah, I don't think the intention is to give the Elite or Xbox One S controller a run for it's money.